The Book with no Pictures will have you in stitches. This book has no plot. It is just silly! 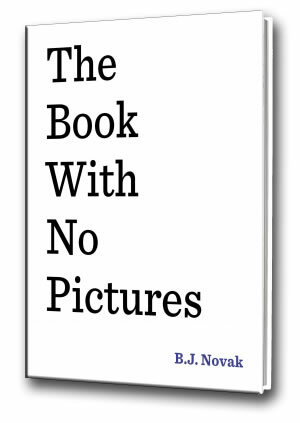 Simple but clever, The book with no pictures inspires a child’s imagination and makes reading fun. In his book, actor/comedian/screenwriter B.J. Novak asks the reader to play with words by saying silly things in funny voices. Kids also learn that they can make up their own stories filled with crazy words and sounds. So you just don’t need pictures to be entertained! Simple, large type may help younger kids read or identify some words. The narrator speaks directly to the reader but The book with no pictures is best read aloud with a child and their caregiver or in a group situation, in order to get the full effect of the text. Local History Officer David Brooks thrilled kids with his reading of The book with no pictures during the recent Dad’s Read and Make a toolbox event at the Library (part of the Library’s summer holiday program). Their hilarious laughter filled the Library. This entry was posted in recommended reading, review and tagged Anstey, B.J. Novak, The Book with No Pictures by Penny Cowell. Bookmark the permalink.